This relaxed, urban-casual leather rocker recliner features seam-tufted back cushions, pillow arms, and a fully enclosed chaise-style footrest. Shown here in Derby Almond leather. 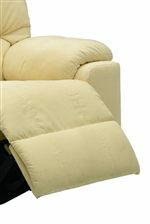 Available in a wide variety of leathers and fabrics by special order. Pricing and availability may vary. The Picard 37" Casual Leather Rocker Recliner by Palliser at Jordan's Home Furnishings in the New Minas, Halifax, and Canning, Nova Scotia area. Product availability may vary. Contact us for the most current availability on this product. Arm Generously padded pillow arm. Seat Back Generously padded seam-tufted back. Seat Seat cushions are constructed of high resiliency foam. Footrest Operation Pull exterior release to open footrest and recline. Sit forward and push down with legs to close footrest. The Picard collection is a great option if you are looking for Casual furniture in the New Minas, Halifax, and Canning, Nova Scotia area. Browse other items in the Picard collection from Jordan's Home Furnishings in the New Minas, Halifax, and Canning, Nova Scotia area.